The main principle of the Hänel Lean-Lift is storage rationalisation. At the centre of this closed system is a computer controlled lift, called the extractor, which moves up and down via the smooth action rollers, collecting and returning items to present to the operator via the open access point. There are multiple slots of 25mm, 37.5mm, 75mm or 90mm in the Lean-Lift where numerous storage shelves can be placed, whereby you hold a range of your stock, tools and parts in trays at height optimised positions for total maximisation of your warehouse. The machine can be used as a standalone system, or for large applications multiple Hänel Lean-Lifts can be implemented to cater for your needs and support you in the future. 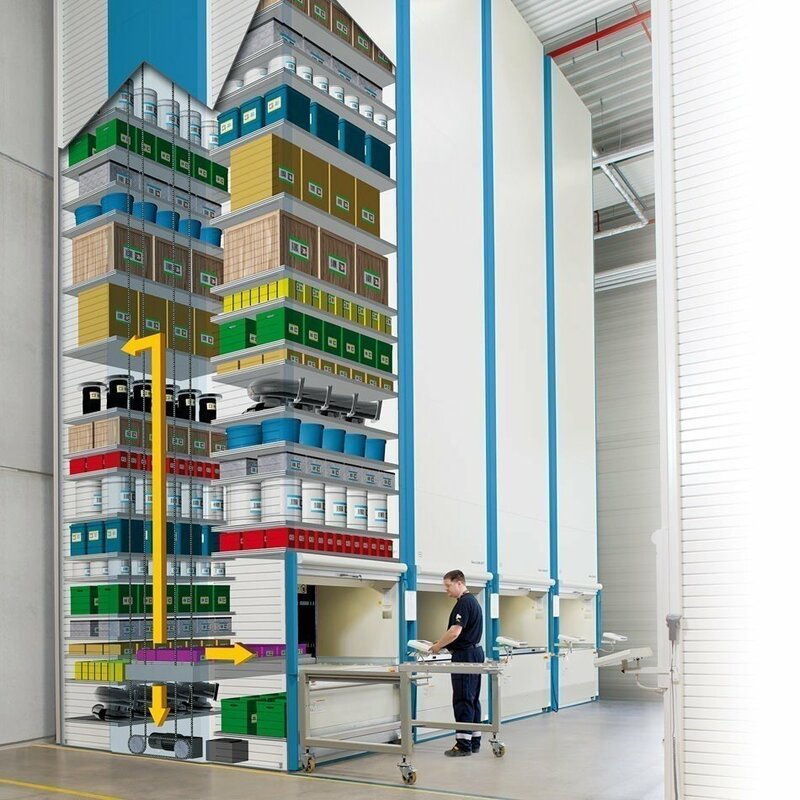 The Hänel Lean-Lift can span several floor levels, with multiple access points in different areas, creating the maximum possible storage space on a minimal footprint. You can have peace of mind in knowing you can expand your storage capacity at any time with Industore, and our experienced team can also take care of relocations quickly, reliably and professionally. You will find applications of the Lean-Lift in a wide variety of industries, such as tools storage in the automotive sector, to medical apparatus used in pharmaceutical, right through to goods stored in food and beverage. This automated solution proves its versatility time and time again. There are a range of tray options to choose from - width sizes from 840mm to 3260mm and depth sizes from 635mm to 1270mm. Our diverse range of clients store a mix of heavy tools, small parts and large quantities of stock, which are all secured and protected - Hänel trays even store 100 year old whisky bottles! If you’re storing electrical components, we can provide antistatic coating for your chosen trays which will help protect your sensitive electronic components. We also offer fully galvanised and powder coated options. The open access point of the Lean-Lift is where you collect your items. For larger warehouses located on many floors, you can achieve multiple access points for different departmental staff. This enables staff to access the items needed quickly and more efficiently. This sophisticated machine also offers a multifunction positioning system where built in light sensors take height measurements of the storage trays for optimal packing density on multiple levels. When you have different sized stored items, the light sensors measure these items and the microprocessor control system finds the optimum storage location in the Lean-Lift. The Lean-Lift is equipped with a weight management system as standard. An electronic 4-point weighing system can be used to weigh each tray in the access point, presenting immediately on the computer display. The motors in the Lean-Lift provide rapid acceleration and maintains smooth braking at all times. For example, the vertical speed of travel for trays with a load capacity up to 500kg is 2.3 m/sec with an empty extractor, and 1m/sec with a loaded extractor. Horizontally the extractor travels at a speed of 0.5 m/sec. This clever machine minimises the amount of noise you can expect thanks to optimised chain wheels and rubber dampers maintaining a consistent sound pressure. The Lean-Lift has a 4-point suspension extractor alongside 4-chain technology. Inventory management programs are intelligent software systems for the computerised handling of storage processes. All elements are listed via the touchscreen monitor where all data is stored and recorded. Built in one of the best manufacturing facilities in Germany, you can expect a reliable machine proven to eliminate the risk of health and safety incidents in the workplace. Each machine comes with a protective light curtain as standard, which continuously monitors its own functional reliability. If a fault happens to occur, the sophisticated control system quickly and safely switches the lift off to avoid any potential harm to the user. Electromagnetic spring pressure brakes are also built in to the machine to avoid any lags. Industore has seen a steady increase in demand for storage systems benefitting from temperature controlled environments and clean and dry store rooms. Specifically for those needing to adhere to high quality standards, companies turn to Industore for their solution. From semiconductor components in the electronics market to sensitive substances in the pharmaceutical industry, specific items need to be stored and monitored under controlled conditions. In the Lean-Lift you can efficiently store all your electrical components, chemically sensitive substances, medicines and perishable goods all in the one place, as climate levels can be maintained by automatic, high speed closing doors, with the option to have sealed, airlock doors if required. A component of Hänel’s high-speed-picking concept is the Pick-o-Light system which quickly identifies the location of your required items. The system works using an LED array which integrates into the panel above the access opening of the Lean-Lift. The system searches all items stored and a coloured LED beams a ray of light directly onto the identified item for rapid selection. Hänel offer Pick-o-Light-Vario which is perfect for variable container divisions. In the same way as Pick-o-Light, items are identified by LEDs but with the Vario solution you will have 4 integrated lights on a free moving unit in the Lean-Lift. With a number of different items stored, it can be common for the items required in a pick list to be located in different containers on different levels within the Lean-Lift. With Hänel’s pre-store buffering, the time needed to access consecutive containers is considerably reduced. Whilst the operator takes the required item from the first container at the access point, the extractor is already bringing the second container to a storage location directly behind the access point. Then, once the operator has finished with the first container this is stored directly behind the access point and the second container is delivered to the operator. This feature is particularly popular with businesses storing large amounts of small parts. For transparency and traceability over high value parts and secure monitoring of stock, an integrated camera can be the right move for your business. Each time an item is selected or returned to the Lean-Lift, an up-to-date photograph of the tray is taken. For larger operations, one or more cameras can be integrated to monitor goods in and out at each access point, this guarantees an optimal visual overview of your whole storage situation at all times. Moreover, a simple logistics operation can be introduced into your business by integrating cameras, as a number of images are archived per tray so that inventory fluctuations can be seen and actioned accordingly. Choose from a range of colour designs for your chosen machine. Whether you opt for one of the popular standard finishes or proceed with a premium colour, your machine will integrate neatly into your warehouse or stand out with confidence – the choice is yours. Nowadays, more and more businesses are searching for new and improved ways to reduce their carbon footprint across their organisation. Automated storage and retrieval systems have been proven to have a positive impact on the environment, effectively consuming energy whilst in motion and reducing energy loss whilst stationary. Throughout the years Hänel have always placed great emphasis on continually improving their machines for energy consumption. Careful selection of high-quality, modern components and technologies allows for further energy savings. With The Lean-Lift, a high rate of efficiency is ensured by the lift’s drive components, as well as the minimisation of friction during tray movements where the smooth action plastic rollers help to avoid friction loss on each tray return. What’s more, motors controlled by a frequency converter use up to 50% less energy than drives running at full load powered directly from the mains. We understand that with the ever increasing energy prices of today, you’ll need to factor in costs, consumption and benefits not only for your department but for your entire environment. With Industore you can reduce your CO2 emissions and return almost half your expended energy back into your supply network by adding the EcoDrive system into your automated storage lift. EcoDrive will convert the kinetic energy of the extractor into electrical energy and feed it back into the electrical supply system of your machine. This enables up to 40% power recovery that can be used effectively, for example, in powering your other automated devices in your network. The EcoDrive can even help companies adhere to overarching green and environmental policies without disrupting or restricting operations. With the EcoDrive you’ll be able to reduce your power usage by on average up to 40%, and achieve cost savings alongside a massive reduction in CO2 emissions. With the EcoMode system from Hänel, you can sustain complete control over your energy consumption. Through four different power-saving levels, Lean-Lifts that remain at standstill for long periods of time without being operated can be turned off automatically. This reduces the energy intake of your automated storage systems to a minimum when they are not being operated. Once the machine is activated via the controller, the Lean-Lift will return to its full operational readiness in no time at all. For shift work, or machines operated only during certain times in the day, time intervals can be programmed which shut down all machines as and when required and can be adapted precisely to your workplace needs.